LAWRENCE — His name might not be as well-known as others on the University of Kansas basketball coaching tree, e.g., Naismith, Allen, Smith and Williams. But John McLendon is a two-time inductee into the Basketball Hall of Fame, and a new documentary directed by KU Film & Media Studies Professor Kevin Willmott shows why – for good and ill.
“Fast Break: The Legendary John McLendon” traces the title subject’s path from learning the game at the side of inventor James Naismith himself to coaching in college, the pros and the Olympics. 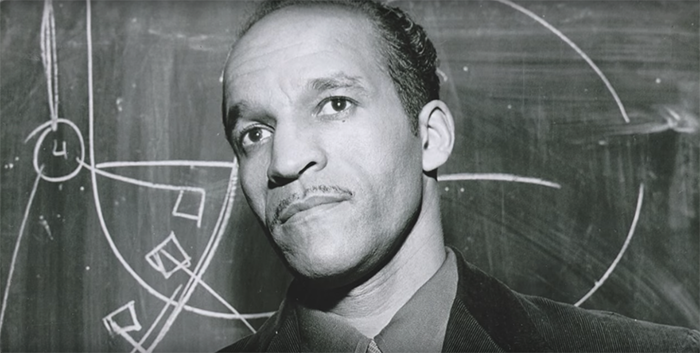 And all along the way, in addition to his coaching innovations and successes, McLendon was a social trailblazer, becoming the first African-American to graduate from KU with a degree in physical education; to coach an integrated pro team; to coach at a predominantly white college; to coach the U.S. Olympic team and then to serve on the U.S. Olympic committee. The film is set to air at 8:30 p.m. Monday, Thursday and Saturday, March 13, 16 and 18, on PBS television station KCPT in Kansas City, Missouri, coinciding with the first week of the 2017 NCAA Men’s Basketball Tournament. Perhaps the film’s centerpiece is a recounting of the legendary 1944 “Secret Game,” played between McLendon’s North Carolina College of Negroes team and that of the all-white Duke University Medical School. The barrier-breaking event was arranged in secrecy and played in an otherwise empty gym to circumvent Jim Crow laws that forbade teams of different races from playing each other. Former KU head basketball coach Larry Brown, who played under McLendon on the 1964 U.S. Olympic team, and current coach Bill Self are among those interviewed for the film. Willmott, who is best known for making such independent films as “Ninth Street,” “C.S.A. : The Confederate States of America” and “Jayhawkers,” said “Fast Break” was a horse of a different color for him. Willmott said that, as a part of the KU community, he is proud that he could and it is fitting that he should play a role in bringing McLendon’s story to a wider audience with the new film. The film is a production of Broken Fence Film Ranch, Rockhaven Films and Level Club productions. DVD copies are available online.